It was ushered into the studio by six burly bodyguards and an entourage of fourteen; no filming was allowed of its movement from a taxi into the building; and to maintain its anonymity it was transported in an aluminium case packed with foam. CNN's London team catches World Cup fever. It is not often the World Cup trophy comes to town but when it does, even a newsroom as hardened to the glamour of celebrity and big-name personalities as CNN's, was unable to contain its collective excitement. 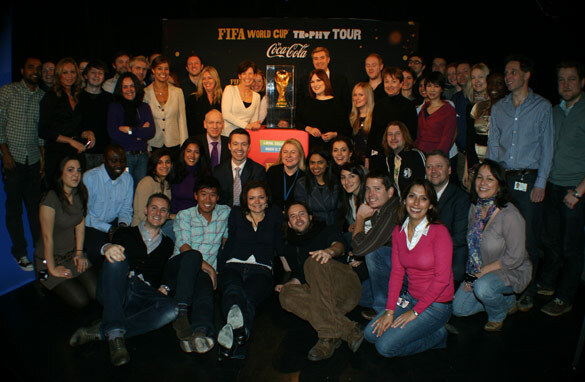 Queues of smiling journalists rapidly formed to get a photo with the hallowed artefact, to get close to an object that football legends such as Diego Maradona and Pele sweat blood and tears to call their own for a few precious moments, and fans from Delhi to Denver covet on behalf of their nation. The attention attracted by the World Cup is unique, and in a measure that seemed befitting, the handlers advised that only players who have won the tournament or heads of state would be allowed to touch the metal surface. Neither present amongst CNN's ranks, so breathing near to the trophy had to suffice. In fact, due to failure at successive events, it is maybe no surprise that this particular version of the cup has visited British shores only once before; a trip that must always jangle the nerves of those organizing the tour. Afterall, England does not have a great record concerning the security of this particular valued item. As hosts to the event in 1966, shortly before the opening game was due to kick off at Wembley, the World Cup was stolen from an exhibition in London. The blushes of a nation were only saved when a dog named Pickles found the Jules Rimet trophy (the first version of the World Cup kept by Brazil on becoming world champions for the third time in 1970) wrapped in newspaper seven day's later. The current version, used for the first time in 1974, is solid 18-carat gold. It measures 36.8 centimeters (14.5 inches) high and weighs in at six kilograms (14 pounds). The gold alone would be valued at $220,000 at current market prices, though the tour party told CNN the trophy is "invaluable." The drawing power of the cup, which will have visited 83 nations before arriving for the party in South Africa in June, suggests this assertion is true - with thousands of soccer fans around the world, including many in the CNN office, clamouring to get close to the small hunk of metal. No one knows who will be the lucky captain lifting the trophy in Soccer City on July 11; but one thing is for sure, the team crowned world champions will be the envy of the world when they walk away with the golden prize. The World Cup event is indeed a celebration of life. Let's wish the players, officials, fans, organizers and the mediapersons a jolly good time in South Africa. "The wonder of the World Cup" is a nice little write up by Ben Wyatt. Thanks.